It was as if the entire galaxy of stars had come down to the earth when Sachin Tendulkar, Amitabh Bachchan, Sunil Gavaskar and Gundappa Viswanath came together under one roof. It was mutual admiration both ways as Amitabh paid rich tributes to cricketers who in turn showered praise on the King of Indian cinema at a function to felicitate Gavaskar and Viswanath on their contributions to Indian cricket. 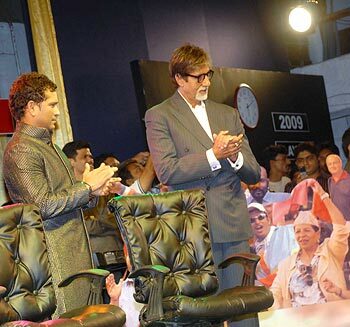 Tendulkar applauded Bachchan for his outstanding role in the film Black, saying he had never seen any performance like that. 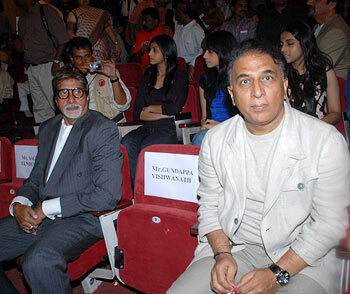 When quizzed by the master batsman on how he had prepared for the role, Bachchan replied: "Black was a very special film for me and I am thankful to everyone who worked on the film. It was a very good story and it also took care of the issue of physically challenged children. "A little girl who is deaf, dumb and blind is rare because handicapped children may be deaf and dumb or blind and dumb but one faculty is always available to them. But here was one child minus all the faculties. So here the sign language of how to communicate with them is totally different. For six months we trained with an institution that taught us how to communicate." "In Black what was difficult was that we were making a film so when the girl will make a dialogue or say something, I have to understand it. I have to make the audience understand as well. So every time we had to speak twice -- once to translate what she is saying and then to give my reaction to her. So that became to a little tough to first translate and then express it. "But that girl was phenomenonal and she learnt very quickly. She spent time with the institution where they taught her how to communicate. One of Sanjay Leela Bhansali's assistants was also physically challenged, just like the character. So it was very convenient to take tips from her when we were going wrong or saying something wrong," the actor concluded. 'Talking and walking English, Amitabh style!